Volleyball is often played out of system, so teams must learn to adjust their offense for these imperfect scenarios. University of Dayton coach Matt Affolder instructs his team to play “5 and 5” — 5 feet into the court and 5 feet off the net — when out of system. —The digger passes the ball high into the middle of the court. 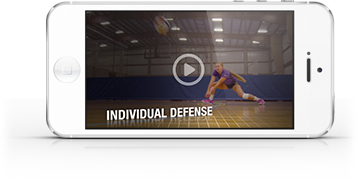 —The setter or libero (depending on who took the first ball) sets the ball high so it drops into the “5 and 5” space. This gives the attacker an opportunity to hit rather than just giving the opponent a free ball. Watch the video to see how it’s done.